This document is also available for download via a PDF White Paper. 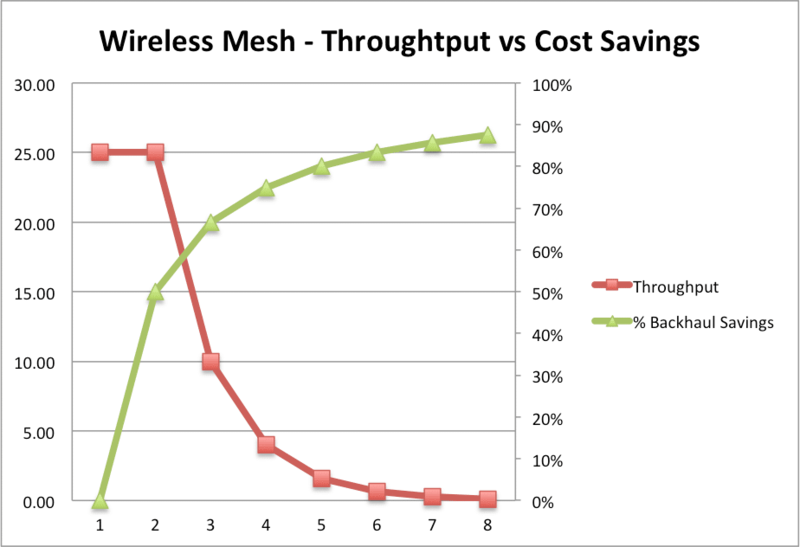 The Wireless Mesh Cost vs Throughput Spreadsheet. The “Magic” in magic is really just a combination of illusion and mis-direction. And yet we are entertained by being convinced we’ve seen something that breaks known physical laws. We know the woman really isn’t being sawn in half, yet we don’t mind suspending reality for a couple of minutes while we try and figure out how the magician is doing his magic. In the world of Wireless Mesh, sometimes WLAN professionals get too caught up in the mis-direction and illusion of getting something for nothing that we forget all about the laws of physics that determine connections and throughput and watch as our customers suspend reality hoping to get something for nothing, and not paying any penalties. In reality, there is nothing “magic” about Wireless Mesh. It follows known laws concerning RF propagation, packet transfers, and network packet protocols. I believe that Wireless Mesh does have it’s place in WLAN Design… but many people, in their quest to save a bit of money end up ruining their Wi-Fi network by employing mesh incorrectly. To emphasize this point, I’ve developed an Excel Spreadsheet and made it available to download. (Link to Mesh Analysis Spreadsheet) – this spreadsheet, like all good spreadsheets, pulls the variables out where you can see them. All the fields colored in Green are the input points for the algorithms. You, as a WLAN designer can choose your own amounts for these. Remember – the Mesh AP’s must be within range to have great SNR to maintain this data throughput! number of Access Points to provide coverage for clients, as well as enough Mesh AP’s to maintain high throughput speeds between 5GHz Mesh RF connections. Average Loss in Percentage per additional Hop. I’ve started with the minimum loss of 50%, in actuality there could be 10% to 15% more loss because of overhead and other issues. Remember, you are the one to make these assumptions. This is not something that I’m making up – you put in your actual costs, size of system, assumptions on data throughput and number of clients per access point. You can use this spreadsheet to work with your customers/clients to help them better understand the value and costs of providing Wireless Mesh versus other alternatives like Ethernet cable or a dedicated Wireless Bridge. Also remember the first hop is ‘free’ – only kind of – since there isn’t the requisite 50% loss on this first hop. The receiving Mesh AP doesn’t need to re-transmit the packet on the 5GHz channel. The client packet comes into AP #1 on 2.4GHz, AP #1 then re-transmits the packet on 5GHz, then AP #2 receives the packet and places it directly on it’s Ethernet port. But for subsequent Mesh Hops, AP #2 would have to re-transmit the packet on the same 5GHz channel it came in on… thus the 50% drop (Plus additional loses due to overhead issues) Each subsequent hop also results in this drastic degradation of data throughput. Here are some graphical examples of this process of going to multiple hops. The horizontal access is number of Mesh AP’s – one more than the Mesh Hop (two meshed AP’s equals one Mesh Hop). Note the gradual reduction in total cost as you add more Mesh Hops. It is true that adding Mesh rather than Ethernet will save you money, but only on the installation costs, not the actual cost of the Access Point. But also note the drastic drop in throughput as you add more hops. In this graph we can see as the average cost per installed AP drops (savings from the Ethernet cabling costs as you go with more and more Mesh Hops) the actual cost per kilobyte for each end user skyrockets. This is a function of more and more client devices sharing less and less actual Ethernet backhaul. 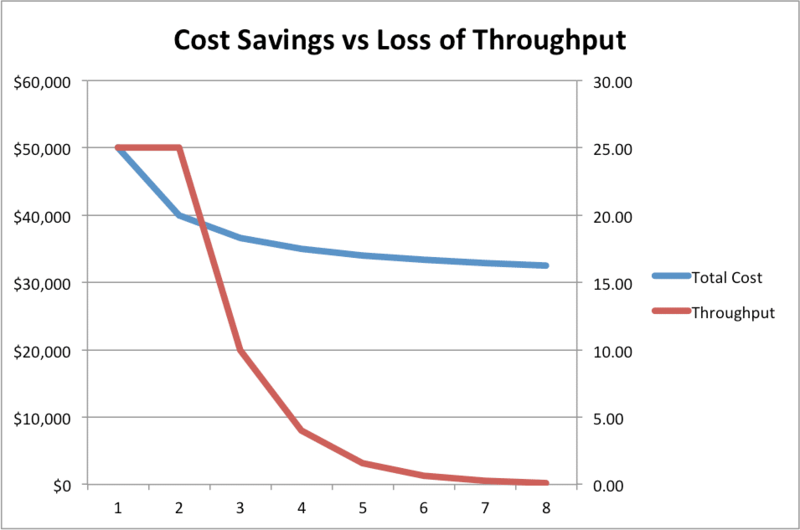 In this final graph we’ll focus on comparing the savings in percentage of lowered backhaul costs, compared with the loss of throughput. The “Sweet Spot” is at two Mesh AP’s or one Mesh Hop. Each additional Mesh Hop barely adds much in the way of cost savings, but instead has a huge drop in throughput. Feel free to try out this spreadsheet on your own and see how little is actually saved in adding more mesh hops, then compare the huge drop in throughput as well as it’s associated costs per Kilobyte to end users. Learn from the experience of others, and don’t get caught with a Wireless Mesh system that doesn’t provide for the requirements of your client devices. 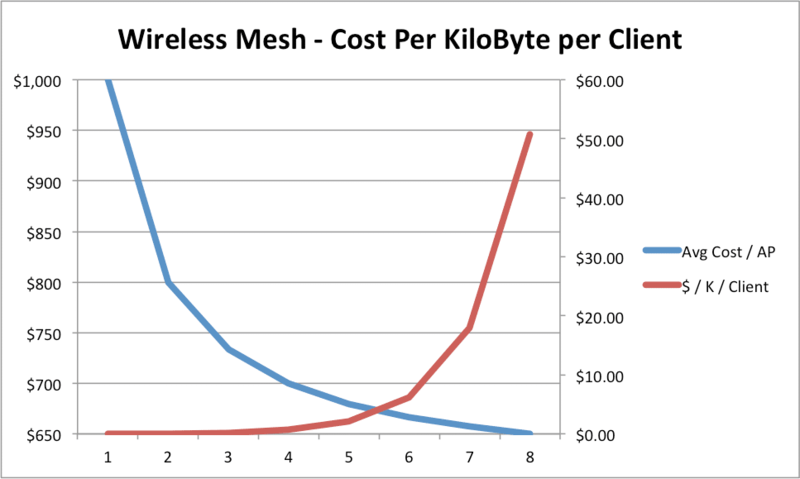 Wireless Mesh isn’t “Magic” – it’s merely an illusion of cost savings – you still can’t break the laws of physics.